Rakhi is not just another Indian festival but more of a bond that all Indian siblings share with one another. It is a day that marks and strengthens the relationship between brothers and sisters where a sister ties a thread on the wrist of her brother who in turn promises to protect her from all dangers and threats. There is also an exchange of gifts between them. Since there is a lot of migration of people from India to abroad, the distances have become large these days but it is all such traditions and festivals that keep one another united. Like on Rakhi, all brothers and sisters do take time out to send some really thoughtful rakhi gifts to each other which show that they care! While some send it abroad there are others who from the overseas Send Rakhi gifts to India. These days sending gifts for all such occasions have become so easy with the access to the Worldwide Web. For instance, to be able to send a Rakhi gift to India, all that one need to do is to log on to the internet and in a matter of few minutes one can send presents from any part of the world to India. This ease of access is once again bringing families closer and the enthusiasm which was once dying has once again been revived. 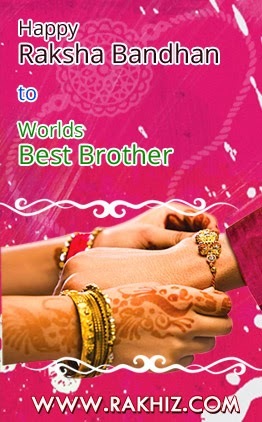 This enthusiasm, especially with which today this festival of Rakhsha Bandhan is being celebrated across the globe amongst all Indians, is clearly visible with the wide variety of Rakhi gifts and hampers that are being made available not just in retail stores but all across the internet which makes sending Rakhis and gifts across the world so much easier. From wherever in the world you are, all it takes is a few clicks and in a jiffy your Rakhi gifts reach your siblings, however close or far they maybe geographically. Nowadays one can get beautiful Rakhis made out of silk threads using various colours and these are decorated with beautiful ornaments as well. There is a lot of artistry that has, with time, enhanced the way a Rakhi is made. One can choose between a Rakhi that has a miniature of an idol of god or for the younger brothers, one often chooses something with superhero motif or a cartoon. On the other hand as gifts sweets, stuffed toys, jewellery and chocolates have all become quite popular. However, whatever is the gift and in whatever way a Rakhi is made, what’s more important are the sacred feelings and best wishes of siblings which ties them together,and this small thread sheds away all distances between a brother and sister, bringing them close to each other. Whether you are sending a Rakhi gift to India or sending it from the country, there are a number of options available online that not just give you a great variety of gifts and Rakhi threads but you can also customize your presents to suit your need and choice. Whatsoever you may choose, remember to cherish your sibling because they are not just your oldest companions but also your closest friend. Voice out your love with Rakhi gifts and see the way your brother or sister feels as the happiest person in this whole wide world and that moment is what is going to be far more valuable and expensive than any possible gift that you would have laid your money upon.Bring a smile on their faces and see one spread across yours; that is how a relationship between a brother and sister is, no matter how much you fight or argue but in the end, they are and will be your oldest and bestest friend!